What Is IPTV Internet Protocol Television? You’ve probably experienced a derivative of Internet Protocol Television (IPTV) but may not have realized it. If you streamed a TV show or movie online, from Amazon, Hulu or a TV network website, you used a similar technology. Internet Protocol Television (IPTV) delivers television content via Internet Protocol (IP) networks. A central provider offers the service which bears similarity to the delivery method of cable and satellite technologies. The difference is that IPTV doesn’t always obtain proper rights for distribution of the programming for which it provides feeds. Immediacy denotes another difference between cable, satellite and terrestrial television. With IPTV, the viewer choose what to watch when they want to watch it. It doesn’t require setting a DVR. To view an episode of your favorite crime drama, you simply click on the show to start streaming it. So long as that episode aired already, it streams. It requires a subscription and a client media player. video on demand (VOD), similar to that offered by Amazon or Netflix. IPTV requires not only a subscription and player, but also high-speed Internet access and a set-top box. This varies vastly from Internet television (ITV) which refers to television programs streamed via the Internet on distinct channels. With ITV, the user normally changes websites to change to a different station. For example, they might watch some programming on the Fox website on their computer, then navigate to the NBC website to watch another show. While this feed might also be accessed via a smart TV, it requires navigating to a website to choose programming. IPTV simply feeds streaming television into a set-top box that resembles a cable box in design and function. Rather than navigating to websites, the user chooses programming as they would with a remote control and cable or satellite box. While ITV allows downloads in some cases, IPTV only provides streaming. IPTV also provides feeds for corporate and private network feeds. The wide divergence in operators implementing IPTV in various countries has resulted in a lack of standardization. In Europe, IPTV undergoes an ongoing standardization process via the European Telecommunications Standards Institute. Europe is also governed by the Hybrid Broadcast Broadband TV (HBBTV) consortium. The HBBTV encompasses companies involved in establishment, promotion or provision of hybrid set-top boxes. Those involved in the industry want to create an open European standard. This led to the development of HBBTV set-top boxes housing a broadcast tuner and Ethernet port. First released by Advanced Digital Broadcast, it was first offered in conjunction with Spain’s Telefonica, to serve its Movistar TV service. Another IPTV method uses a system similar to the Headend used by Sky cable TV. It distributes multiple TV channels via satellite to the provider’s point of presence (POP) or to the user’s Internet Service Provider (ISP). From there, each subscriber receives an IP-encapsulated distribution. This method results in an extensive selection of channels without overtaxing the Internet trunking to the point of presence. Using this method, small or rural providers outside the service area of high speed via fiber lines. IPTV Americas uses this method to service Latin America and the Caribbean. ITU-T also handles standard setting. It adopted Recommendation G.hn (G.9960) on December 2008. The home networking standard states a common PHY/MAC may operate over any home wiring. Home wiring specified by the standard includes coaxial cables, phone lines and power lines. IEC sets standards relating to POF networking at Gigabit speed. Another major standardization effort in IPTV services is a project by both ETSI and ITU-T to develop IMS-based IPTV standards. These standards involve 3GPP IP Multimedia Subsystem (IMS) as a support architecture for telecommunications network carriers. This standard enables carriers to offer IPTV and voice services via the same infrastructure. It combines traditional television service with features like on-screen caller ID. Other industry groups have developed alternate methods and standards. These include the Home Phoneline Networking Alliance, HomePlug Powerline Alliance, Multimedia over Coax Alliance and Quasar Alliance. Precept Software developed IPTV in 1995. Its founders, Bill Carrico and Judith Estrin, developed the technology as an Mbone-compatible Unix- and Windows-based app to transmit single and multi-source audio and video feeds. Working with software designers Karl Auerbach, Steve Casner and Cha Chee Kuan, they developed software that provided transmissions ranging from low quality to DVD quality. They used unicast and IP multicast protocols: Real-time Transport Protocol (RTP) and Real-time Control Protocol (RTCP). Cisco Systems bought Precept Software in 1998, thereby acquiring the IP/TV technology and trademark. Kingston Communications founded the first IPTV subscriber service in 1999. The United Kingdom telecommunications operator offered Kingston Interactive Television (KIT) transmitted by digital subscriber line (DSL) service. It added a video on demand service in 2001. KIT closed in 2006. While it might seem that an Internet service would have a handful of major providers like Wal-Mart or Alibaba lead e-retail, instead the IPTV industry has various national and regional providers. In some countries, such as the US, not all aspects of IPTV services are legal. In many areas, telecoms provide the legal services. Australia: TPG launched its IPTV service in 2007, offering it as a complement to its ADSL2+ package. Other providers servicing the country include the ISP iiNet and Telstra which also link their television service to their Internet services. Hospitality IPTV Ltd. offers closed network IPTV systems and OTT delivery platforms. Canada: NBTel, also known as Bell Aliant initiated IPTV in 1999. It transmits via DSL coupled with iMagic TV and the Alcatel 7350 DSLAM. Sasktel also began offering IPTV in 2002. It uses the Lucent Stinger DSL platform. Dominican Republic: Claro TV offers IPTV service. El Salvador: Claro TV offers IPTV service. Guatemala: Claro TV offers IPTV service. Honduras: Claro TV offers IPTV service. India: A number of services offer IPTV, including APSFL, MTNL, BSNL and Jio. Kazakhstan: National provider Kazakhtelecom JSC offers IPTV, as does Alacast. Malaysia: Astro, DETV, Fine TV and Telekom Malaysia offer IPTV services. New Brunswick & Nova Scotia: Bell Aliant initiated service in 2000 as VibeVision using the same iMagic TV system. New Zealand: Hospitality IPTV Ltd. offers closed network IPTV systems and OTT delivery platforms. Nicaragua: Claro TV offers IPTV service. North America: SureWest Communications introduced IPTV with high-definition television (HDTV) channels in 2005. North Korea: Korean Central Television (KCTV) introduced IPTV in 2016 coupled with a set-top box technology known as manbang, a word meaning “everywhere” in English. Pakistan: Pakistan Telecommunication Company Limited has offered IPTV service since 2008. PTCL offers the service under the brand name PTCL Smart TV. Philippines: PLDT offers Cignal IPTV services in combination with its ADSL services. Sri Lanka: Sri Lanka Telecom offers IPTV under the brand PEO TV. Sweden: In Bredbandsbolaget began offering its IPTV service in 2005, becoming the first service provider in that nation. Its competitor, TeliaSonera took over as the largest provider in 2009, attracting more customers. Turkey: TTNET offers its IPtivibu service nationwide as Tivibu EV. Superonline launched their service, “WebTV,” in 2011. United Kingdom: BT offers the IPTV service BT Vision. United States: CenturyLink began serving limited US markets in 2010 under the Prism brand. One of the country’s largest telecom’s, AT&T, offers the U-verse IPTV service. Google Fiber offers an IPTV service via a fiber optic network that features up to one Gigabit-speed internet and IPTV channels. Other firms have only recently introduced the service. The countries with upstart services include: Bosnia, Bulgaria, Chile, Colombia, Croatia, Czech Republic, Denmark, Estonia, Finland, Georgia, Greece, Herzegovina, Hungary, Iceland, Latvia, Lithuania, Macedonia, Moldova, Mongolia, Montenegro, the Netherlands, Norway, Poland, Romania, Serbia, Slovenia, Slovakia, Sweden, Turkey, and Uzbekistan. IPTV has yet to really take off, but it has seen significant growth. In 2009, subscribers numbered 28 million globally. By 2013, that number reached 83 million. While this generated global revenue of USD $12 billion in 2009, it rose to USD $38 billion in 2013. Asia and Europe lead in subscriber numbers, but Europe and North America pull the greatest revenue share. This occurs because China and India generate low average revenue per user (ARPU) although they’re the seat of the fastest growth in subscribers. Central and Eastern Europe have recently experienced growth in subscriber numbers. India, Latin America, Pakistan and Sri Lanka have introduced services. Russia plans to introduce IPTV. It has room for growth though. The significant costs of modern cable make an IP-based platform like IPTV a more sensible approach. IPTV provides interactive capabilities and lets the user personalize their services and delivery modes. IPTV uses existing modes of data transport, but the cable industry expends about $1 billion annually on network upgrades and updates to accommodate higher data speeds. Not every area has this to overcome. For instance, South Korea requires providers to offer a minimum connection speed of 100 Mbit/s. Its six million homes have access to extremely high-speed connections, in juxtaposition to the United Kingdom where legacy systems struggle with delivery at 3 to 5 Mbits in some areas. This issue becomes most pronounced in last-mile delivery. The bandwidth for these outlying areas tends to only hold the capability of supporting one to three channel streams simultaneously. Many countries do provide legal IPTV services through at least one carrier. These carriers may be part of a government sponsored service provider, such as Kazakhstan or through a major telecom such as AT&T. Many independent IPTV services in Canada and the US function illegally because they have not paid the licensing fees to each of the stations they stream for broadcast. Some operate in the US but house their servers outside the country which does not affect the legality of transmission. Without proper licensing, every stream constitutes a copyright violation regardless of its storage point or origination point. Both Canada and the US have begun pursuing illegal operators. According to Just Answer Law, so far, the viewers of the feeds haven’t been pegged for illegal behavior. The illegality centers on the person or entity providing the streams. In the US, for example, each illegal stream constitutes a count of copyright infringement that carries up to a $150,000 fine. It can also carry a criminal penalty of five years prison time per violation. While residential subscribers enjoy IPTV services for entertainment, viewing television, videos and movies, commercial and corporate use varies greatly. In a business setting, IPTV is used to simultaneously stream audio-visual media to multiple screens in large-scale settings like airports, hotels, offices, schools and sports stadiums. Hybrid IPTV refers to a service that combines interactive services like catch-up TV, e-government, Internet apps, gaming, shopping, surveillance, video on demand and video telephony delivered to the television set. It includes traditional broadcast TV services, too. Delivery occurs via public Internet access or a managed IP network. Hybrid IPTV spawned from two influences. First, the popularity of online video aggregators, like YouTube and Vimeo, put pressure on traditional pay TV operators to provide a way for viewers to watch online video on their television. Second, telecommunications providers and ISPs want ways to bundle analog and digital terrestrial services with their current offerings while keeping costs the same and keeping transmission operations simple. They search for methods that keep bandwidth low and use existing infrastructure. The set-top box required allows the operator to introduce new services seamlessly. IPTV providers try to leverage the existing electrical and communications wiring available. This means they use the home’s existing power lines, telephone lines or coaxial cables. The most modern system uses wireless hardware found in the home, such as its WiFi server. IPTV head-end: The head-end of an Internet or satellite feed are where the encoding encryption and delivery of AV sources and live TV channels occurs to form IP multicast streams. Video on Demand (VOD) platform: The VOD platform can be distinct or part of the IPTV head-end. It’s the storage location of video assets. It serves the video as an IP unicast stream to process a user request. Interactive portal: The portal lets the user navigate the provider’s services, i.e. the channel guide and VOD catalog. Delivery network: The delivery network uses packet switching to transmit IP packets to deliver unicast and multicast broadcasts. Endpoints: Endpoints consist of any user equipment capable of requesting, decoding and delivering IPTV broadcast streams. It includes computers, mobile devices and set-top boxes. Home TV gateway: An item of residential user equipment capable of terminating the access link from the IPTV delivery network. User set-top box: The set-top box is a physical equipment item used to decode and decrypt television and VOD streaming broadcasts. Centralized architecture model: The centralized architecture model is one of the two main types of video server architecture used to deploy IPTV. It stores all media on centralized servers. It requires no comprehensive content distribution system. This method works best for a network with a small deployment video on demand service, an adequate core and edge bandwidth and a content delivery network (CDN) that functions efficiently. Distributed architecture: A distributed architecture scales as well as a centralized architecture but with more advantageous bandwidth use. It’s designed for larger server network management. IPTV uses a switched IP network to deliver additional content and functionality than other methods. A switched IP network uses less bandwidth because it houses the content on the network and only streams the content a user chooses when they choose it. Conversely, the typical satellite or television network broadcasts video content in a constant flow to a set-top box. This downstream flow lets the consumer choose from as many choices as the provider can pipe into the home. It does, in some cases, open the door to hackers if the provider doesn’t use the appropriate security measures. The most common security issue is the denial of service hacks. The expense to the consumer for IPTV differs greatly from standard cable or satellite. While traditional methods such as those, require a hefty monthly expense, IPTV costs about ten times less than that monthly. The difference is that the consumer purchases the set-top box. For example, the American firm Millennium IPTV charges $150 for its set-top box, a one-time fee. The monthly subscription for content is $20. This is the reverse of many common cable offers in the US which offer a free box or equipment but charge $50 or more monthly. 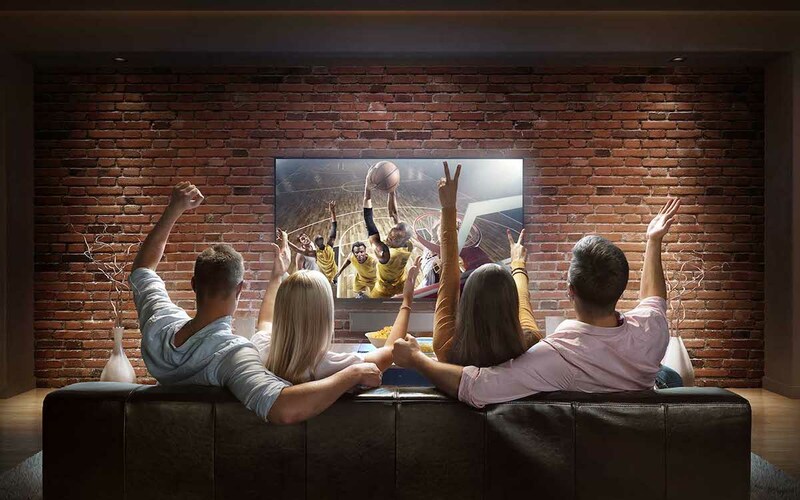 While cable and satellite offer picture-in-picture functionality for channel surfing without leaving their current program, IPTV offers advanced smart perks. It lets viewers access the Internet from TV as they view programming, like a sports event. They can check player stats as they watch or alter the camera angle and zoom. Some IPTV systems enable PC access from the television. Smart features like using a cell phone to schedule DVR recordings or alter parental controls have been a part of IPTV offerings from their conceptions. IPTV isn’t infallible. It still has development needs. For example, it suffers packet loss sensitivity and streaming delays with unreliable data. The broadband requirement for IPTV exists due to the need for speed to facilitate delivery of film at the appropriate frames per second via the Internet. In a theaters, this is 24 frames per second. Online, it ranges from 25 to 30 frames per second, depending on the electrical systems of the country. At present, the growth of IPTV is limited by the availability of widespread broadband and limited bandwidth. IPTV requires diverse protocols since it hosts both multi-casted live TV and unicasted VOD. Either feed type requires a broadband connection which may be via a fixed or wireless IP network. This connects the user’s game console, personal computer, set-top box, smartphone, smart TV or tablet. This diversity of video compression is provided by the use of numerous codecs. Live or VOD streams use either a H.263 or H.264 codec. A MDCT codec compresses the audio. The video streams using Flash Video packets, a MPEG transport stream or RTP packets. IP multicasting lets live events stream to multiple receivers using one multicast group address. Internet streams of lesser bit rate standards use the H.264/MPEG-4 AVC codec. ISDN video conferencing uses codecs H.261 and H.263, designed for higher bit rates. Storage applications and single link broadcasts may use the H.262/MPEG-1/2 codec. It requires hefty bandwidth and can quickly saturate a network, making it an ill-advised choice for streaming multicasts. Standards-based IPTV systems tend to use similar protocol systems. These depend on the content source. Service provider-based streams use a variety of protocols to serve a multitude of data types. Subscribing to a live multicast or transitioning from one live multicast to another uses IGMP. Local area networks (LANs) and wide area networks (WANs) serve IP multicasts which are normally routed using Protocol Independent Multicast (PIM) in the network core. VOD uses a negotiated unicast connection relying on the Real-time Transport Protocol (RTP) transmitted via a H.222 stream over Transmission Control Protocol (TCP) or the User Datagram Protocol (UDP) for encapsulation. Webcasts rely on a number of media player applications including Adobe Flash Player, the Apple iOS player and Microsoft Silverlight. Each uses a different method and protocol. Adobe’s application uses RTMP over TCP. It works with AMF, JSON transactions or XML for setup and control, while Apple uses embedded M3U playlist files. Apple streams HLS adaptive bitrate streaming over HTTP. Microsoft Silverlight also streams via HTTP but using an adaptive bitrate streaming method to provide smooth playback. Web-based live multicasts and streaming video on demand use recommendations from the Internet Engineering Task Force (IETF). It encourages RTP transmitted via TCP or UDP using setup and control of RTSP over TCP. A connected device includes game consoles, networked personal video recorders, set-top boxes and smart televisions. IPTV provided by a telecom normally uses a walled garden network. For local area network content it uses UPnP AV for unicasted media transmitted via HTTP over TCP. For a live multicast it uses RTP via UDP. The user can access Web-based content from the connected device. The Web content travels via inline Web plug-in or a TV broadcast-based app. Content using the app uses a middleware language, for example, MHEG-5, to activate discrete events like loading a Web browser that features the Adobe Flash Player plug-in. Business IPTV generally distributes an audio visual feed to company networks using a mixture of traditional equipment and a computer network. A business set up such as those used in airports, hotels or schools uses conventional televisions, IPTV encoders and IPTV gateways. The gateways IP wrap a broadcast MPEG channel to form multicast streams. Hybrid IPTV networks combine satellite television feeds with IPTV. Since the Internet connection can also be delivered via satellite, it can deliver all media in areas lacking terrestrial cabling. It can also replace slower terrestrial cables which don’t allow as great a transmission speed nor as great a bandwidth. As with any topic, an introduction likely whets the appetite for further information. Once you’ve developed a tertiary grasp of IPTV, this collection of academic articles, blogs, books and Web sites enables you to continue exploring various aspects of the topic. Millennium IPTV: How Does IPTV Work? Millennium IPTV: What Is IPTV? Εvery thing is very open with a clear description of the challenges. It was truly informative. Your websit is very helpful.Thank you for sharing!